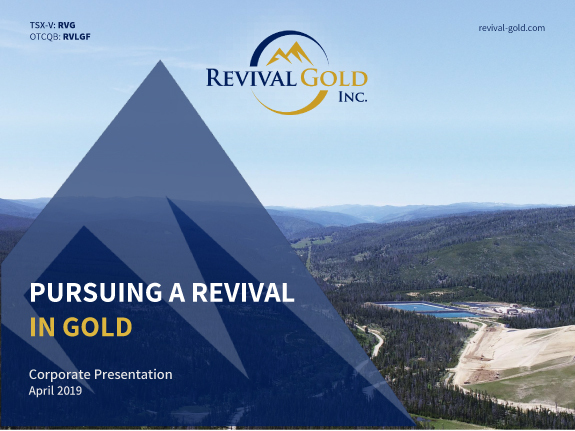 Revival Gold Intersects Near Surface Oxide Gold at Arnett and Extends Beartrack Mineralized Trend by 250 meters - Revival Gold Inc.
Toronto, ON – December 4th, 2018 – Revival Gold Inc. (TSXV: RVG, OTCQB: RVLGF) (“Revival Gold” or the “Company”), a growth-focused gold exploration and development company, announces the release of favourable drill results at the Company’s Arnett gold project (“Arnett”) and adjacent Beartrack gold project (“Beartrack”), located in Lemhi County, Idaho. AC18-15D intersected 2.25 g/t Au over 3.1 meters1. BT18-220D intersected 1.79 g/t Au over 38.8 meters2 from 457 to 496 meters south of the Joss area.1 Drilled width; true width estimated to be approximately equal to drilled width. “Revival Gold’s initial drill results in the Haidee area at Arnett confirm the presence of another potential source of oxide material seven kilometers from the legacy leach plant infrastructure at Beartrack”, said Hugh Agro, President & CEO. “At Beartrack itself we have extended the mineralized trend a further 250 meters south of Joss for a total of 950 meters south along strike from the South Pit area where the current Mineral Resource ends”. Revival Gold completed an initial six hole 900-meter core drilling program in the Haidee area at Arnett in November. The program successfully confirmed the presence and nature of gold mineralization encountered by previous operators including Meridian Gold (“Meridian”) in the 1990’s. A seventh planned hole was not drilled due to inclement weather. 1 True width is estimated to be approximately equivalent to drilled width. Numbers may not add up due to rounding. 2 Recovery for the interval 47.6 m to 49.1 meters was 44%. Gold mineralization in the Haidee area is oxidized and occurs from near surface to a currently drilled depth of 125 meters. Mineralization remains open along strike to the south and at depth. Additional drilling is planned in 2019 to further explore the strike and depth potential at Haidee and to begin exploration across the Arnett property. Mineralization at Haidee often occurs as visible native gold within oxidized pyrite which can result in highly variable assay values. This nugget effect is present, even when larger samples sizes (two assay-tonne) are used. For this reason, Revival Gold intends to follow-up its conventional two assay-tonne fire assays at Haidee with metallic screen assays of larger-than-normal pulps. Figure 1 presents two cross section views depicting both Revival Gold’s and Meridian’s available core drill results at Haidee for the selected sections. Results are pending for the final two core holes from the 2018 Arnett drill program. Most of the drill holes released to date from Beartrack in 2018 (BT18-207D through BT18-217D) were targeted to expand the current open pit-constrained Mineral Resource. Drill hole BT18-218D was drilled in the previously untested area between the South Pit and Joss target. Results released today continue to demonstrate potential for resource expansion (BT18-219D) and, in the case of BT18-220D, push Revival Gold’s drilling further into the previously unexplored area south of Joss. BT18-219D successfully extended gold mineralization at depth in the South Pit area. BT18-220D was drilled approximately 250 meters beyond the nearest drill hole at Joss and demonstrates the potential to expand the known mineralized area at Joss significantly along strike. Revival Gold’s drilling has now extended the mineralized trend along the Panther Creek Fault to approximately 950 meters south of the existing Mineral Resource at the South Pit. The 2018 drilling program ended in mid-November with a total of fifteen core holes completed at Beartrack for approximately 7,600 meters. Results are pending for the final two core holes from the 2018 Beartrack drilling campaign. 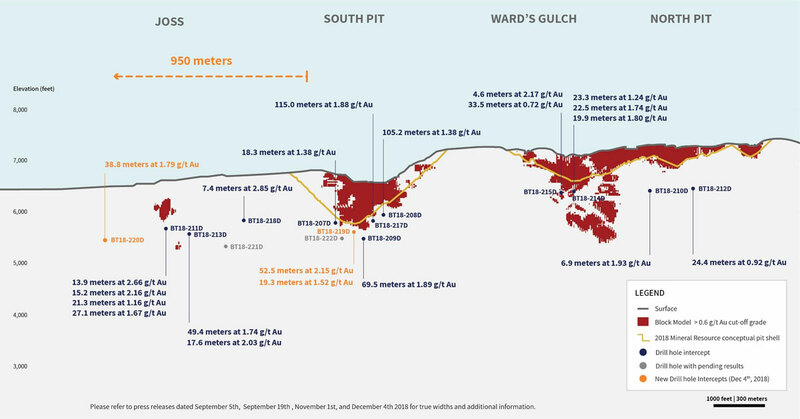 1 True width estimates in the South Pit and Ward’s Gulch areas, as well as the area between the South Pit and Joss, are based on a vertically dipping mineral zone. True width in the Joss area is unknown (n/a). Drill holes typically steepen during drilling so the inclination of the drill hole at depth may not be the same as the inclination in the mineralized zone. Numbers may not add up due to rounding. 2 Recovery for the intervals 507.5 meters to 509.0 meters was 0%. This interval was included at zero grade. Figure 2 illustrates a north-west facing long-section view at Beartrack from the north end of the North Pit Zone to the south end of the Joss Zone (approximately 4 kilometers) with the current Mineral Resource block model and the location of all thirteen holes completed and released to-date this year. Gold assays for Beartrack are determined by fire assay and AAS on a 30-gram nominal sample weight (Au-AA25). For shallow holes targeting leachable mineralization, gold is also determined by cyanide leach with an AAS finish on a nominal 30-gram sample weight (Au-AA13). 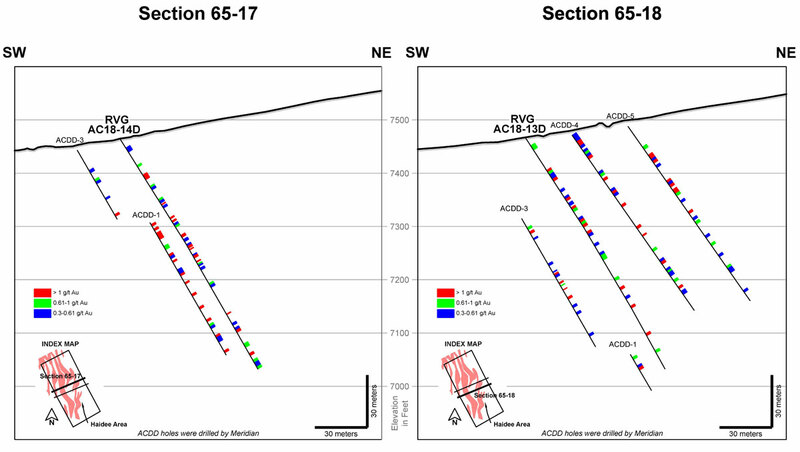 Multi element geochemical analyses are completed on selected drill holes using the ME-MS 61 method. Sample preparation for Beartrack uses the Prep 31 method, which involves the preparation of a 250-gram pulp. Gold assays for Arnett are determined by fire assay and AAS on a 50-gram nominal sample weight (Au-AA24). For some of the Arnett holes, gold is also determined by cyanide leach with an AAS finish on a nominal 30-gram sample weight (Au-AA13). Multi element geochemical analyses are completed on selected drill holes using the ME-MS 61 method. Sample preparation for Arnett uses the Prep 31B method, which involves the preparation of a 1,000-gram pulp.